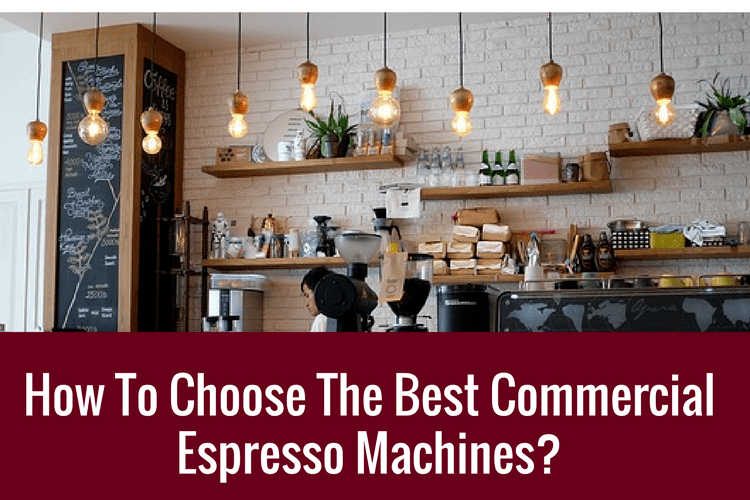 [GUIDE 2019] How To Choose The Best Commercial Espresso Machines? Whether you’re sat in your home around a table, entertaining a number of guests in your shop, or just want to offer great customer service, coffee is a great way to make people feel comfortable and open up conversation. Unfortunately if you’re with more than a handful of people, you require a lot more than your usual French press or percolator to provide them with great coffee. You need a coffee machine that is going to offer you a lot of coffee, but still have a great taste. Thankfully those types of machines aren’t just confined to the coffee shops. If you are trying to provide coffee to a large number of people then you hopefully have a bit more space than you would do in your kitchen. While advanced coffee machines don’t have to take up a huge amount of space, they would be too big for most homes. A lot of coffee machines in the home are one time use as well, which isn’t ideal if you will have a large number of customers wanting to use a machine throughout a day. By one time use, I mean that you are usually left with a pot of coffee that will cool over time or have just a single cup. In order to re-do the process you are looking at going through the whole process again which can take too much time. There are machines available where, with just one or two presses of a button, you can leave it to work its magic and leave you with the coffee you desire. If you’re going to invest in a coffee machine when you need to know exactly what you’re after and how much time and effort that you want to put in. One of the most appealing types of machine available are the ‘bean to cup’ machines that are a simple way of delivering what you need. With these machines you load them up with the required ingredients and they can produce a high volume of coffee with a few clicks of a button. Most are very easy to operate and someone coming into your shop and using it for the first time would know how to operate them. There is a massive ease of use advantage with bean to cup machines and they can be great if you want to be able to take a backward step and let your customers get their own coffee. There are also espresso machines which are more like the type that you will see in the back of a coffee shop. They require a bit more expertise, but are great if you plan to allocate a bit more time to making great coffee. Both types of machines deliver a high volume of coffee before needing to be refilled, but capacity is important so you always want to check how much they hold and what their water capacity is. Another key area to check is the speed of the machine, the importance of speed varies depending on the context you are in. If you’re trying to keep a customer’s attention, speed can be key. If you’re trying to give a more relaxed and longer level of customer service, then a little wait wouldn’t be a big deal. You want to be customer-facing, then you might not be able to hide an ugly old coffee machine in the back of your shop. If you want coffee as an open and available resource, then you will care about how the machine looks. Thankfully the big brand machine makers have great design teams, and all coffee machines have a sense of style, but individual choice matters. There is something that goes hand-in-hand with coffee and design, and you will want customers to be impressed by the machines they are using. That need to impress them can also extend to features, but then there is also a balance to be struck. While it’s generally thought that the more features, the better, this isn’t exactly always true. If you had a coffee machine that looked like the cockpit of a commercial airliner then it could put people off altogether. If you want customers to be able to use the machine, you want enough features to be impressive, but not too many that it makes operating the machine difficult. Coffee is an almost universal way for people to interact and enjoy the taste, aroma and stimulation that it provides. Having one in your shop is a great idea to get people engaged. There are many things to consider when you buy a machine, including how much power they use and how difficult they are to clean. Here we will have a look at the best machines on the market, what they offer and also what their drawbacks are. Providing great coffee to customers has never been easier, but that means that the level of choice has never been more difficult too. The Breville BES840XL is a machine that provides great espresso at just a few presses of a button. One of the main drawbacks with this device is that is that it is solely for the purpose of making espresso. So, if you’re looking for a machine that delivers different types of coffee then you’ll have to look elsewhere. It’s a very aesthetically pleasing machine when it comes in its stainless steel. But if you’re looking to add a touch of color then they also have options in black and red which can add a sense of style. As far as making espresso goes, it ticks all the boxes and can be guaranteed to taste great. Its low pressure pre-infusion makes for an even extraction and the pump accurately controls the water pressure. This model is easy to use and allows for cups of all sizes. If you’re looking for other types of coffee then it also produces hot water so you are able to suit for needs. Not only does the Mr. Coffee makes espresso, but it also delivers perfect cappuccino and latte as well. It's simple design is a positive and a negative. A positive as it is simple to use with clear buttons to press should you want espresso, cappuccino or latte. While the simple look is great for easy functionality, it might not make for a very aesthetically pleasing look as the front of it can look as little cheap. It is however a one-touch machine so if you have little time to spend attending to your coffee machine. This allows people to use it without any prior knowledge to get their perfect beverage. The water reservoir is removable which only adds to its ease of use. And if used regularly, it can provide customers with a constant source of coffee that will always taste good. The milk reservoir, however if not used often will need placing back into the fridge regularly. The DeLonghi ESAM3300 is another machine that provides both espresso and cappuccino. What sets the DeLonghi apart is its patented “cappuccino system” which provides the user with a rich and creamy froth for their drink. Like the Mr. Coffee it has push button functionality and is very easy to use, but does it with a greater sense of style as the machine looks contemporary and stylish. It provides coffee quickly and is very low maintenance. The machine has all the features and functionality of a full sized coffee machine, it is actually quite compact so if you are struggling for space or have a small spot available, this could be the perfect choice. If you are looking for a bit more variety to your coffee, the DeLonghi also has a couple of dials which will allow you to get the coffee that you wish. The machine grinds fresh beans each time, leaving you with a great cup of coffee each time. The Aicok is a highly rated machine that is capable of providing espresso, cappuccino, latte and moka. So you can always get your perfect cup, whatever you desire. This is a semi-automatic so does require a bit more effort from the user. It is easy to use and the coffee is delivered quickly. Its wide variety of options make it a very attractive choice and its design will make the user feel like their own barista. Aicok is efficient and fast and provides quick coffee without using up too much power. Whilst it is quite a small machine when compared to others, it has a 1.25l water capacity so you won’t have to refill it too often. But while that is a large capacity for the overall size of the machine, there are other options available which will require filling a lot less often. If you have limited space, then this would be a great choice. The Breville BES870BSXL is a leader in its class which not only looks great, but provides perfect coffee every time. There is something fascinating about watching a machine in action, and having the coffee beans in a see-through container at the top of the machine feels like a genius move. Like the other Breville machine mentioned, it comes in stainless steel, black and red giving you numerous options. It is a large machine with a 2L water tank capacity so it will require minimal supervision. This model provides perfect coffee each time and while it may have numerous buttons on the front, they are very clearly labelled meaning a novice would easily be able to work out how to use the machine. It is impressive to look at and has impressive results. This Breville will have you feeling like a professional Barista in no time. It takes up a lot of power, but that can only be expected of a machine with this size and capability. Comes with numerous functions, such as the single or double shot which is a great addition. It produces a thick and rich coffee as it manages to grind the beans in under a minute which captures the freshness of the bean. It is an immensely highly rated product and a leader in its class, and it’s easy to see why. As we discussed, when choosing your favorite coffee machine there are a lot of things to consider such as how many drinks would you expect the machine to make in a day, what type of drink would your customers prefer and what kind of space do you have to work with. If you can only choose one, consider the Breville BES870BSXL. This would be the perfect choice if you’re looking for a great tasting coffee that can cater to a large audience. If you want a smaller and more simple machine, there are other options available such as the Mr. Coffee machine we reviewed, but for all round usability, it has to be the Barista Express from Breville.